I am spending the weekend getting caught up on so many things. I have not forgotten about blogging on this blog, but having my You-in-Ubuntu Blog over at Ubuntu-User.com most of the Ubuntu specific stuff is going there now. However later tomorrow I will have more stuff for here as well. Anywho more to come later this weekend - stay tuned! To say I have been busy the last few weeks is an understatement at best. However, I don't think that is necessarily a bad thing, unless I don't stop to smell the roses in my life - my family, and they are awesome! My husband has traveled continuously for the last 5 weeks, stopping at home long enough to repack a bag, have meal with us and back out - we've missed him. My kids, they are awesome. There have been a few days I had appointments for various things and gotten home after they did, (They are teenagers so old enough to home for a few hours alone) and on those occasions, I have returned home to find they worked together to straighten up whatever it was I had missed doing that day. Gotta luv it when teenagers clean without being told - that is so awesome. So I've been stepping away from my computer for a few hours, especially when they are home from school in the evenings and trying really hard not be on at night while they are still awake. This past weekend I took the kids out to eat, then to the mall, and to the movies. I was doing more than just smelling the roses I was attending to my garden. The fragrance is so much sweeter, when care is taken in the nurturing of them and yes they are in those teenage years so we still have some thorns that snag us everyone once in a while. We laughed, and talked about all the things that are on the calendar and they even added a few more things. In short we had fun! We are still remodeling the house and due to the weather conditions our Kitchen installation had to be postponed a couple of weeks until the ground could dry out enough for the delivery trucks to make it up to the house without tearing up the driveway. Painting the living room, Kitchen, and dining room will get completed this week. I have been working with the SCaLE 8x coordinators, and the CA Loco Team for the Ubucon event at SCaLE. I am giving a talk at the WIOS event at SCaLE - A Year NTEU the Ubuntu Community and the FLOSS World. I will also be giving one at the Ubucon at SCaLE - Every NTEU is someone's Guru - How to encourage the NTEU* in your organization. I'm also trying to see how many ubuntu community folks will be there and see if we can't grab a picture while there. I am looking forward to seeing the CA LoCo team members, Akkana Peck, Emma Jane Hogbin, and many many more folks in about 10 days or so. I have also been working helping with the Southeast Linux Fest, as there will be an Ubucon there this year as well. The Call for Papers is still open so I don't know if I have been selected for the main event at SELF yet, but regardless it will be a great event and the Ubucon should rock. There will be an Ubuntu Booth at this event as well, any Ubuntu LoCo team who are planning on attending please feel free to volunteer your time to help staff the booth or help with the Ubucon. Please feel free to email suggestions for topics or submit a session for the Ubucon. Please include SELF Ubucon in the the subject line. I have also joined in on FOSScon, and FOSSevents discussions and planning. Though I can't claim to contribute much to these, but I am enjoying participating where I can. More on this in a separate post. The Ubuntu Women Project is moving forward. As the team has defined that the "official " team member list will come from Launchpad. Subscribers to the mailing list and forums as well as those who are in the IRC channel are encouraged to join the LP team in order to participate in any voting issues. Also members on the Team on LP who are subscribed to the mailing list are encouraged to do so as well, this is another step ensuring communications of all current activities are disseminated to team members. Once the team defined who would vote, a condorcet vote was sent to the LP team members and a decision on the IRC channels was made. Almost all blueprint goals for the Lucid cycle have been meet and soon it will be time to look toward UDS-M. The International Women's Day Competition will end in just a few weeks. February 22, 2010. If you are a women or know a who uses Ubuntu encourage them participate in this Competition. 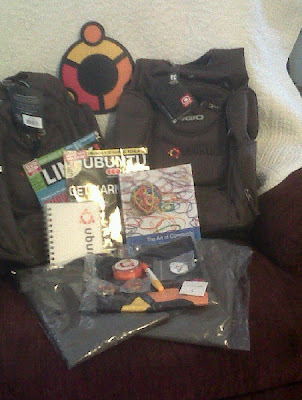 There's a great prize pack, sponsored by Canonical, Linux Pro Magazine and Ubuntu User Magazine also included in Jono Bacon's newest book, The Art of Community. If you a woman in the Ubuntu Community and not a member of the Ubuntu Women Project please consider joining. There are women who's skills range from the highly technical to the just installed ubuntu and everything in between. So whether it's spring boarding into community contribution, developing a talk for an event, planning events, advice on dealing with sexism, or how to encourage women to get involved in Ubuntu and Open Source and more - the Project aims to provide an opportunity for women who want to be involved in the Ubuntu community thereby increasing the diversity in Ubuntu-Linux. Go here to learn more. At UDS-L, the idea for a LoCo Leadership Series was rolled out. It was The goal is to have Chapters 1-3 completed by UDS-M. Chapter 2 has been written now Chapters 1 and 3 need to completed. If you want to help with that email me. Ubuntu USTeams - New interview series targeting approved LoCo teams. These interviews will be posted on the USTeams Website, and the goal is to have the 1st one completed and ready fr March 1st. Looking for a place to help out and like to getting to know people in the community interviewing them is a great way and I already have some questions to start with if you are worried about how to start. Luv it - Ubuntu on a local level. The team is really working hard on becoming an approved LoCo team. There are now Ubuntu Hours in Winston Salem and a regular basis, and the folks in the Asheville area are looking at setting up regular Ubuntu Hours. Members of the LoCo team are working on building up the wnclug group as well. Right now it has an IRC channel on freenode (wnclug) and a mailing list. If you are in NC and you are interested in all things ubuntu please considering joining the team. Oh I am sure there is something else I've been working on but it escapes me at the moment :-) Here's to another awesome week!